What is Christmas for you? Have you grown up decorating Christmas tree, hanging socks to get candies and gifts, leaving milk and cookies for Santa to eat in night? I hardly have known all these in my childhood, as there was no such celebration around our town. Rather we grew up going to the ‘Mondir’ (Bramho religion prayer hall) in the evening for the Christmas prayer (Khristotsav) and lighting candles and then heading straight to the fair (Poush mela) to gobble up delicious cakes at the ‘Monginis’ or ‘sugar and spice’ cake shops. As kids Baba used to read us goodnight stories of Santa coming to some kid’s house to fulfill her secret wish, whom Baba always mentioned as the well behaved, obedient good girl. But still Christmas definitely meant a lot of goodies like the enormous fruit and nut cake that Maa used to bake and chocolates that our uncles brought for us on that day…this continued for quite some time till Maa started her own business and Christmas became another day of soaking the fun n food at the fair. Later as I grew up my love for cooking and baking became evident and when Grandpa gifted Maa one OTG my imagination went wild. I started baking all the cakes that caught my fancy in the magazines and Christmas was a great reason for me to make all our family’s favourite cakes at one go. Then last year the cookie mania caught me hard and now I have almost stopped buying biscuits for entertaining guests. I bake them on regular basis. Preparing these cookies are a little tacky but just follow the instruction and you would be great. I have tweaked the measurement a little (you know me less butter!) for the original recipe check the above link. Sieve the flour, salt, baking powder and coco powder together and keep aside. Cream the butter, oil and sugar till creamy and light (aprox. 3 minutes). Pour in the melted chocolate to this and whisk till it becomes smooth. Slowly add the egg and beat on low for a few second. Add the dry ingredients to this in two batches and mix to get a smooth dough. Divide in two, Wrap in cling film and chill for 2 hours. Follow the same for the peanut butter dough with the ingredients listed there in. divide, cover and chill for atleast 2 hours. To prepare the cookie log take one of each dough. Clean your work surface or take something like an wooden cutting board. Spread some cling film on top (please see notes below). Place one dough in the center and cover it with a big piece of cling film. Roll this to a rectangle of ¼” thickness, cut in half. Do the same with the other dough separately. Now place one half of the peanut butter dough on the top of the chocolate dough. Roll and fold in half. Roll slightly and again fold in half. Roll this to a tight log and fold in half again. Roll it out and then finally start rolling it from the smaller side. Tightly cover in cling film and chill for 4-5 hours (I chilled it over night). Before baking the cookies, preheat the oven at 180 C and grease a cookie tray lined with foil. Take out the log and slice in ¼-1/6” thickness. Place on the baking sheet little apart from each other. Bakes for 8-12 minutes or till the sides start to change colour to a light golden. Cool them on wire rack and store in air tight container. All of you who praised my coffee mug, I got this one free in the Bru Capuchino Big box. Rush to your nearest shop to get this. Chilling the dough is very very important. Even while slicing the log if you feel its becoming sticky chill it once again or the shape and pattern would be lost. Cant emphasize more on using the cling films while rolling. That way it does not stick to the rolling pin or to bottom and handling the spread dough becomes way easier. Also that way you use less oil or flour, which makes it either sticky or dry. While slicing, always rotate the log after each slice. That way you will get perfect rounds every time. Put the remaining dough back to the fridge when one batch is being baked. The dough could be stored for 3-4 days in fridge and the cookies could be stored in an airtight container for 2-3 weeks. If you find the marblelling process tedious just layer one dough on another, roll, freeze and slice. you will get amazing pinwheel cookies. 21.12.10 I baked an eggless version for our neighbors today, it came out well. I replaced egg with milk and flaxseed meal. 3. Ground nut festival to Chitra amma's kitchen. 4. Monthly Mingle: Chocolate Extravaganza, this month hosted at Ria's Collection. 5. Tastebud's Choco Delight Event. 6. Its the time to Jingle again at Asan khana. The marbling on the cookies is great, S. I love the chocolaty feel to these cookies. Perfect as personalized gifts too. 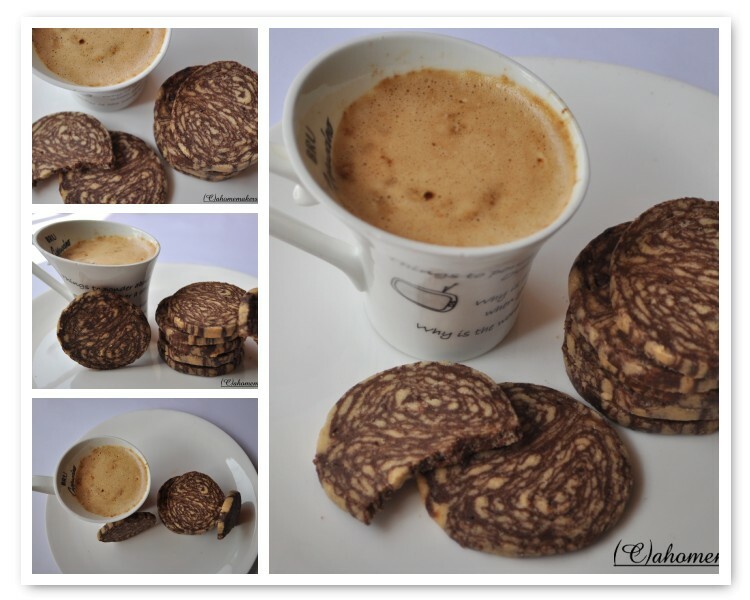 Very unique recipe.. Never thought of this kind of effect on cookies.. Have made pinwhell cookies once.. Have to try this! Fantastic marble cookies, looks simply irresistible..Great work..
they came out perfect...the marbling looks beautiful...i am sure kids will love it! Wow loved the snap as well as the recipe and the texture of the cookies....kamon achhish??? lovely marble cookies.. very much like those chocolate lines criss crossing in it..would be great to devour.. The looks so pretty no ? Must have tasted good to. Looks delicious like the marble idea. Great cookies. The marbling effect is so lovely.. Loved the marble effect. Have made pinwheel types. But this is great job. Yes, it will work but use less sugar unless you are using a natural peanut butter without sugar in it. I have the recipe to make almond butter at home if you want to try that. It is on the blog. antastic marbling Sayantani...you have forced me to go in the kitchen to try it(on my first day of snowy Christmas break)!!! Good work. very nice n innovative cookies..love d rich color..
for all of you who liked the cup thats a free goodie that came with Bru Capuchino. Sayantani..I'm marvelling at ur Marble cookies...They look so perfect and tempting..its no wonder when you bake these they are gone in no time..Awesome Clicks and a pleasure to visit you always...Thanks for ur kind words at my blog..Keep on smiling when u visit me..So many things on the homefront keeps me away from blog hopping and blogging actively as I wd like..but gd to see some of you come back and visit me...that means a lot... LOved ur cup too..
Also enjoyed reading ur last post and knowing more abt you..LOved ur pics of ur garden..the main highlight was the clicks of ur son and ur niece..they are both so adorable and precious. These cookies look so wonderfully crisp and lovely. They are beautiful, and would be great with a cup of coffee. Wowwwwwwwwwww.. Amazing recipe and beautiful presentation.. thanks for the recipe.. nice job !! The marbling looks fantastic! so pretty. wow, those are simply amazing..
Lovely treats for this festive season..!! love the color combination of the cookies..mouth watery.. It looks like a beautiful artwork! Further more it's sugarless, love this recipe dear.. I loved the look of marbled cookies too.. I just ate these..superb tasting cookies with a delicate PB aftertaste.Thanks so much for sending this to me! thanks everyone for your appreciation. @Divya, am glad that you liked it. ooooooooooooooooh!!!!!!BOOKMARKED!!!!!!! !my post shall tell the rest of the comments:-)will keep u informed!! These look delightful Sayantani! My kids just love peanut butter and the marbled look will make it even more irresistible to them..Thanks for sending these to my event, sorry missed out on replying to this entry..
Hi! Kadalaekai Parishe Event Round Up has been posted! Thanks for your entry. These cookies look soooooo amazing. The marbling is awesome.